An early test of Nielsen’s total audience measurement reveals just how much of a program’s audience is overlooked by the current C3 and C7 metrics. 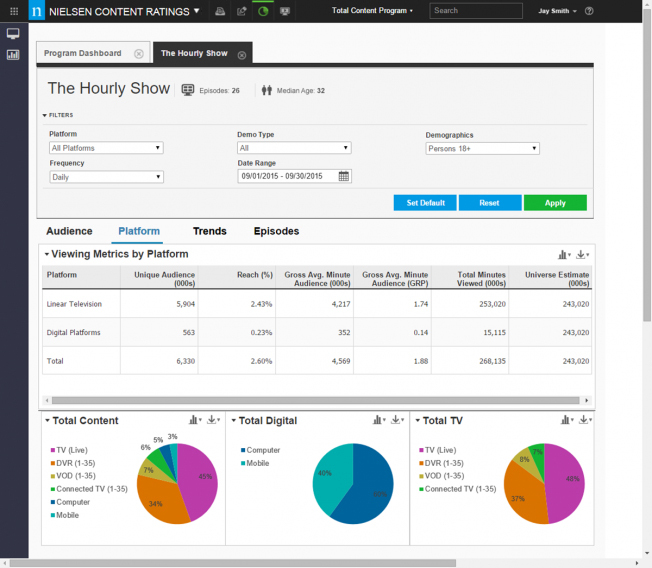 The total audience measurement tool, which will roll out late in the first quarter of 2016 (Nielsen will begin to share data with clients in December, allowing them full access to the tool), will allow users to break down programs by categories like unique audience, reach, gross average minute audience (both in viewers and GRP—gross ratings point, where one GRP is equal to 1 percent of TV households), minutes viewed and frequency (the average number of exposures to a show or network). Users can search across a variety of demos, date ranges and platforms. The tool will include AOL and YouTube alongside the networks. “For total content ratings, we want to have like-for-like, level playing field. Everybody can get measured, and the objective is to have that complete view, regardless of how they’re monetized,” said David Wong, svp, product leadership. Nielsen can also “de-duplicate” the total numbers, removing duplicate views by the same person on different platforms, revealing the total unduplicated audience (which will, of course, be lower than the duplicated audience, given that some viewers were counted multiple times). “This is very powerful, particularly for advertisers, when you’re trying to make sure that you’re managing frequency, you’re capping the amount of times they’ve seen an advertising campaign,” said Clarken. For specific episodes, users can see how it performed over a specific date range and take into account repeat airings of an episode, VOD playback and its performance on other platforms like a network’s websites and apps and SVOD platforms like Hulu. “It is going to help our clients not only be able to value their media assets, but be able to demonstrate what the value is to marketers and to the marketplace, how much interest there is in their media, but it will also help them to make better choices about how to evolve the currency. Because it gives them the flexibility to start to say, ‘What really happens when I put an episode out there? What does the life of an episode look like after it first hits, and then it becomes available on multiple platforms and the windows start to open up.’ This will give all the texture to a consumer behavior around a particular show,” said Wong. While the tool has created comparability metrics among the various platforms, “that doesn’t mean we’re going to ignore the metrics which are relevant to a particular platform” like viewability, said Wong. While Nielsen is often criticized for its inability to fully measure audiences, the company says its hands have been tied as it was forced to adhere to the C3 and C7 metrics agreed to in 2006. Those metrics discount any viewing beyond seven days, most mobile viewing and any content with different ad loads than the original broadcast. In addition to its panel of 20,000 households (which will be doubled this January to 40,000 households or 100,000 people in total), Nielsen has been working with media owners and MVPDs (cable and satellite providers) to install its software development kit (SDK) on their various apps and players. “Panels are never going to be big enough, so we use census measurement so that we can accurately collect every single thing that happens as it happens,” said Clarken. “Then, at the end of the day, it’s always the single-sourced TV panel that connects that data, calibrates it and makes sure it looks right,” said Clarken. The panel then helps Nielsen determine, for example, which video views should be applied to kids who aren’t allowed to have Facebook accounts. When total audience measurement rolls out in December in what svp Kelly Abcarian calls “a private industry preview,” clients will only be able to view their own data but won’t have full use of the tool and can’t see how their content stacks up against others. Then, late in the first quarter of 2016, all clients will have access to the tool, which will allow them to see each other’s performance. Total audience measurement comes as Nielsen is under more pressure than ever to deliver a multiplatform tool. Several companies, including Symphony Advanced Media, have crated tools of their own they hope will allow then to overtake Nielsen as the new ratings standard. On Sept. 29, ComScore announced it will acquire Rentrak in an effort to take on Nielsen. This story reported by Jason Lynch first appeared in Adweek.